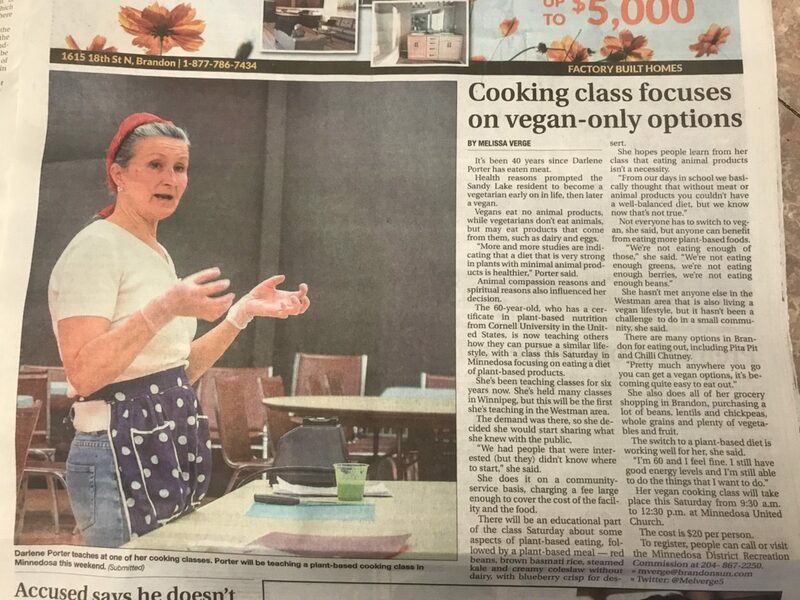 After retiring out to the country four years ago, I finally had my first cooking class out here. We had 11 participants and we had a great class with lots of discussion, sharing and enthusiasm. This was also my first morning class, starting at 9:30 and finishing at 12:30. Place all ingredients in a blender and blend until smooth. For this class, we used spinach for the green, and banana, mango and blueberries for the fruit. Mmmm, love my green smoothies. A great way to add more dark leafy greens and berries to your diet, as well as the anti-inflammatory turmeric. 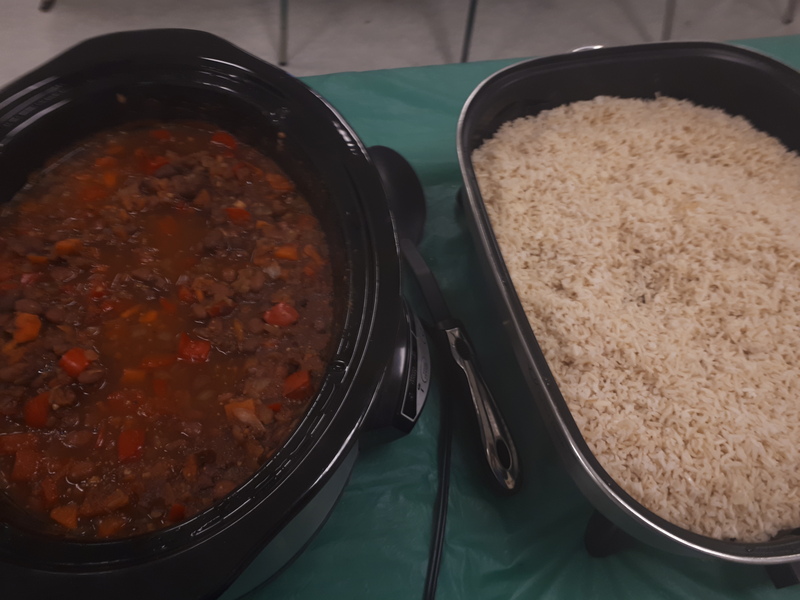 After a discussion on Dr. Gregor’s Daily Dozen and the importance of eating more fibre, especially from beans, we made a simple but delicious main dish of red beans and rice. This budget conscious dish using easy to source ingredients and is full of veggies as well a beans. Served over brown basmati rice for a serving of beans, veggies and whole grains. This recipe is an adaptation of the Creole Red Beans and Rice from PlantPure Kitchen by Kim Campbell. Delicious when topped with salsa and guacamole. In a large pot, add onions, garlic, celery, carrots, peppers and broth (or water). Sauté until onions are translucent. Add tomato paste, maple syrup, mustard, vinegar and spices. Add additional ¼ cup of water or broth. Stir until well combined. Add beans and stir to combine. Taste and adjust spices to your taste, adding hot stuff if desired. Let simmer on low heat for 30 to 60 minutes. Serve with salsa and/ or guacamole. A great salad to pair with the Red Beans is a creamy coleslaw. 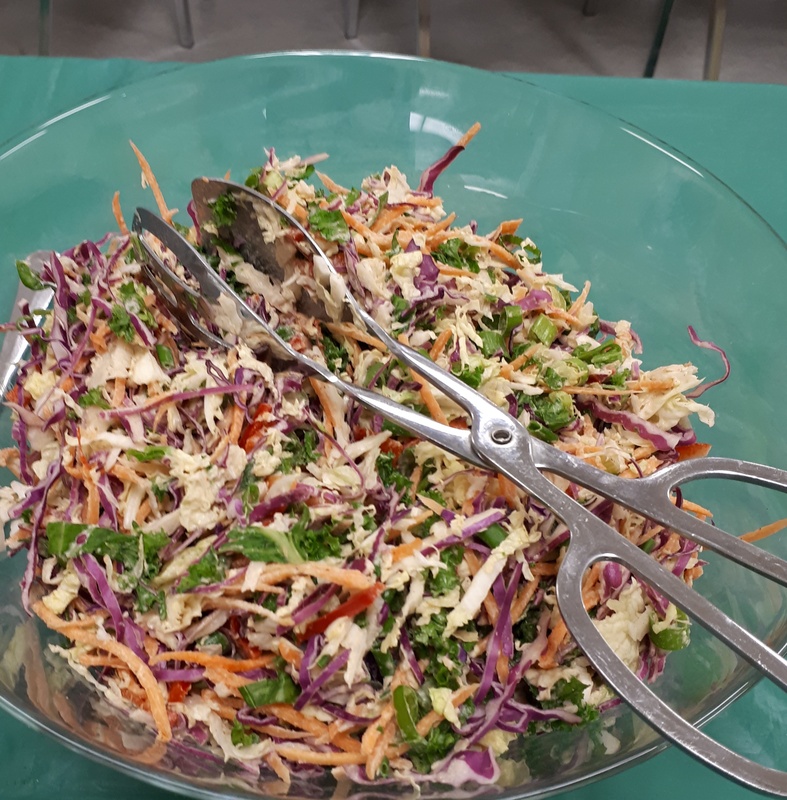 This coleslaw is packed with cruciferous veggies (cabbage family – red and green cabbage and kale) and full of great color. The dressing is oil free and made with cashews which adds good oils, protein, fibre and a whole host of nutrients. In a large bowl, combine cabbage, kale, carrot, onion and red pepper. In a blender, combine drained cashews with remaining ingredients. Blend well and pour over cabbage mixture. Combine well. Greens are so full of nutrition, its important to try to get at least 2 servings (1 packed cup per serving) per day. Steamed greens is a great way to add lots of greens. 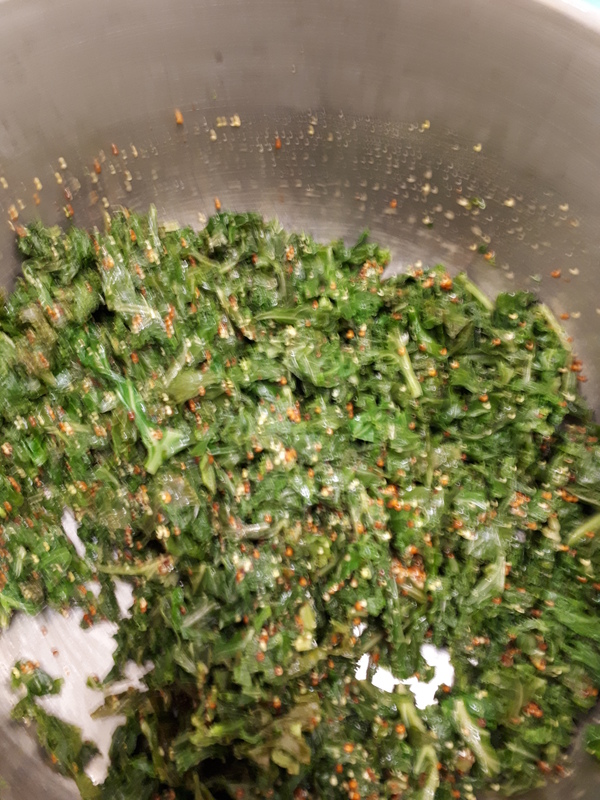 We cooked up a huge pot of kale, which we served with a maple mustard sauce. You can steam or boil your kale, either way they are packed with nutrients. We almost always have a dessert after our evening meal. Nothing sticky or overly sweet, usually a bowl of berries. We try to have at least one serving of berries everyday, and ending your day with a nice bowl of berries fits the bill. In the winter, we use frozen berries, usually blueberries or cherries. Just thaw and eat. Reprogram your taste buds to enjoy the sweetness of fruit without added sugar. 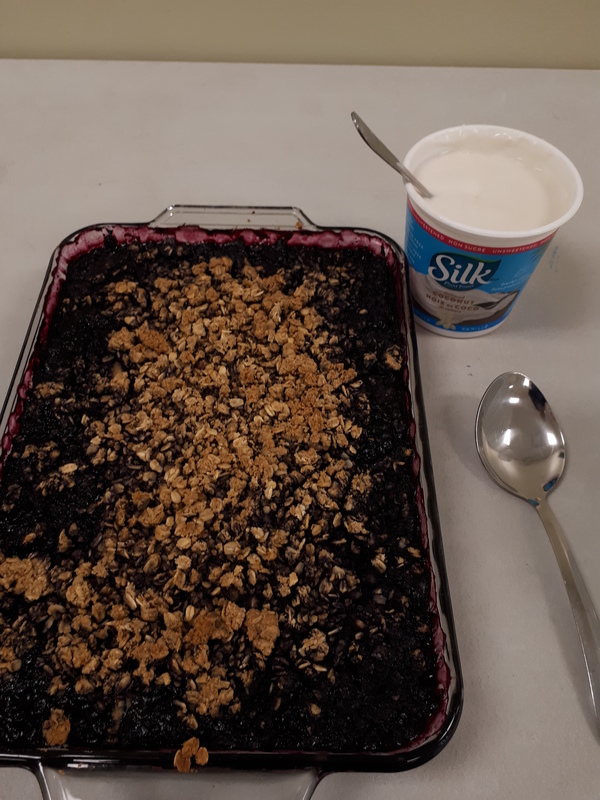 This blueberry crisp is great for a more traditional dessert, without loads of fat or sugar. Sweetened with a touch of maple syrup and a crunchy topping made with nut butter and oats. In a blender, place orange, lemon, maple syrup, water, arrowroot, and cinnamon. Blend until smooth. Place berries in a 8 x 8 inch baking dish. Add contents of blender. Stir to coat. In a medium bowl, combine nut butter with maple syrup, juice and zest. Add oats, oat flour and cinnamon. Mix until crumbly. Sprinkle topping on fruit. Cover with foil and bake for 35 minutes or until fruit is bubbling. Remove foil and bake another 10 minutes until topping is lightly browned. Cool slightly before serving. Serve with cultured coconut milk, banana nice cream or whipped coconut cream, if desired. Thanks to Darcy and Laura for organizing the class. A big thank you to Vicky, my house guest from Germany who was my right hand in the kitchen. And a great big thank you to everyone who came to the class. I enjoyed our discussions. Almost forgot. they had a great writeup in the Brandon Sun on the class.